The current exhibition running at the Museo Enzo Ferrari in Modena is entitled “Capo Lavori Senza Tempo” or “Timeless Masterpieces”, displaying what might be loosely termed iconic road and competition cars produced by the company over the years. These range from a 166 Inter Touring Coupé from 1950 through to the recently announced spectacular Monza SP1 limited production supercar, looking very attractive in a vibrant metallic red hue. Other models on display include an example of the legendary 250 GTO, the supremely elegant 250 GT Lusso, a splendid metallic green “long nose” 275 GTB and the desirable 365 GTS4 “Daytona” Spider. One of the main advantages of the displays in this museum is the clear space surrounding the featured cars, most of which are on raised plinths. This enables one to view them without the clutter of anything to disturb the vision, thus providing the opportunity to concentrate on them individually as the rolling sculptures that they are. The engine house adjacent to the main museum structure, the historic building that was the birthplace of Enzo Ferrari, has had the display format altered, so that the Modena yellow engine display plinths now run diagonally across the room instead of longitudinally as previously. This layout seems more aesthetically pleasing, and they include experimental, production and F1 engines. 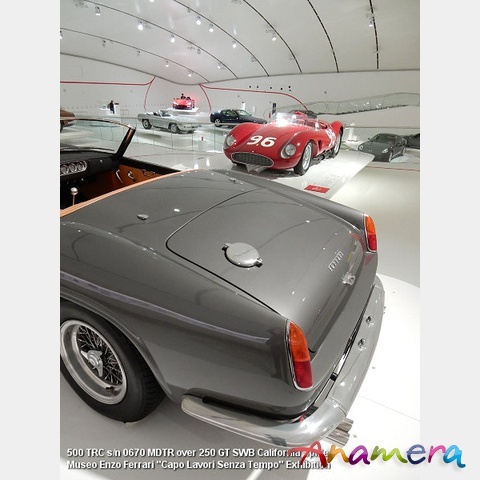 The entrance is via a lobby where there is a recreation of the first Ferrari 125 engine and gearbox on display, from where one enters the main display area with the entrance in one corner. Cars occupy the three other corners of the room, and at the moment these comprise of a Dino 206 GT, a F1-90 F1 car, and a 488 Pista.